Make the ethical choice for home and office cleaning, and let Melbourne’s only fully worker-owned green cleaning service get your space sparking – naturally! 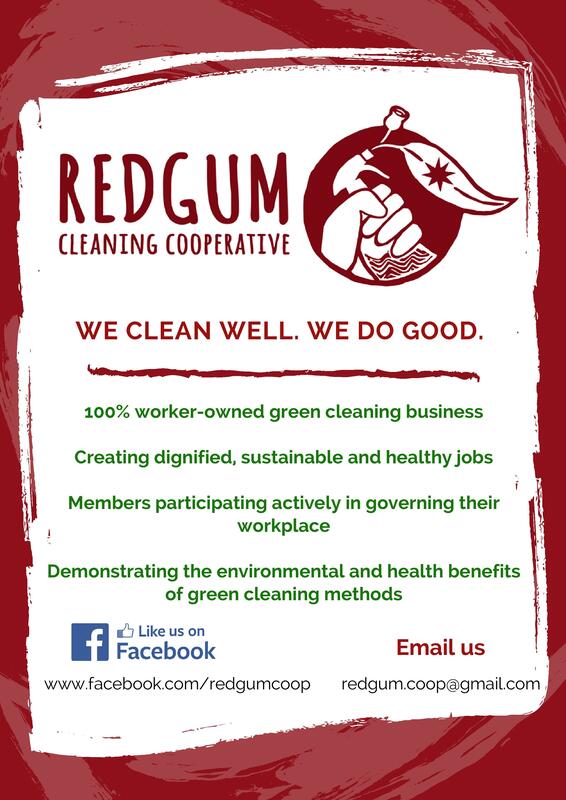 The Redgum Cleaning Cooperative is a worker-owned business in the Earthworker network which launched at the start of 2018. We provide green, chemical-free cleaning services to homes and offices around Melbourne, creating clean, healthy environments for customers and workers alike. We believe cleaners have the right to secure, dignified jobs and fair wages. We are committed to democratic decision making, socially just hiring practices, accessible pricing and ecological responsibility. Most importantly, we are interested in creating good jobs, and spreading cooperative ownership to workers in an industry rife with exploitation. We are all highly experienced cleaners who each own a share in Redgum and have an equal say. We care about our business, our clients and each other! We offer weekly, fortnightly, monthly or one-off cleans at competitive rates. We bring all our own equipment and use natural, non-toxic cleaning products. Feel free to contact us for a free, no obligation quote.